The new Casio WK-7600 offers powerful and extensive features at a price that is unheard of in the portable keyboard market. It offers 820 tones, 260 preset rhythms, 17 track sequencer, 32 channel mixer, as well as audio recording capabilities. Any piece of music you create can be recorded as an audio file on an SDHC card. 9 sliders extend your versatility and provide an impressive 50 draw bar organ tones. DESIGNED FOR STAGE & STUDIO. The CASIO WK-7600 76 note workstation offers powerful and extensive features at a price that is unheard of in the portable keyboard market. With 820 tones, 260 preset rhythms, a 17 track sequencer, 32 channel mixer and audio recording capabilities, the WK7600 is an extremely versatile instrument for any musical project. Whether you are an amateur or professional musician, the WK-7600 will allow you to create, edit and play your compositions at home, in the studio or on the stage. Record and playback digital audio stored on SD memory card. You can also record the microphone and instrument inputs, making the WK-7600 an ideal tool for the recording musician. The 9 sliders function as a traditional tonewheel organ, complete with percussion and rotary speaker DSP effects. They can also be used to control the volume, pan or effects levels on any of the 32 mixer tracks. Choosing an instrument is only the beginning of your musical journey. The next challenge is learning how to play. To give you and your family the best start, we’ve teamed up with Rockschool, a leading music examinations board for rock and pop music. Selected CASIO instruments include a free downloadable book, full of some of the best pop music ever written. It's all designed by leading music educators to encourage progress and keep you motivated. It’s free, it’s a great way to start playing and it’s included with your WK-7600. 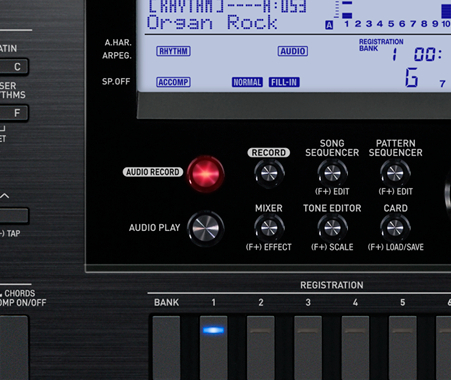 820 Built-In Sounds, 250 Rhythms and 100 DSP Effects. Record & Save Your Performances to SD Card as MIDI or Digital Audio.